Parvatiya Apang Kalyan Sangatha raising the demand of separate development board for physically handicapped peoples of Darjeeling hills today submitted a memorandum to CM through Kalimpong SDO Nirmalya Gharami. The Sangathan as earlier announced that it will be submitting the memorandum. The sangathan has earlier submitted the same to Block Development officer Kalimpong one few days ago and today Sub Divisional Officer. Chotelal Prasad, president of the Sangathan told that the Sangathan said our aim and mission was to put our best endeavor for the upliftment of these handicapped regions in all aspects. We made many representations to the erstwhile government, political parties for assistance but our effort was unheard. Many of us are street dwellers, beggars and homeless who are unable to do physical work. Having no source of income we are totally depended on the mercy of others. We see no ray of hope of life as we are looked down upon by the mass. He informed soon the sangathan will be meeting Dr Harka Bahadur Chhetri . He said the State Government is creating development board to uplift the weaker section of Society , We too being merciful section of the society demand the development board as we too want to held our head high and could feel proud that we are also part of this society of able bodies person. The sangathan have a plan to meet the Chief Minister if she comes to Kalimpong next month informed Prasad. 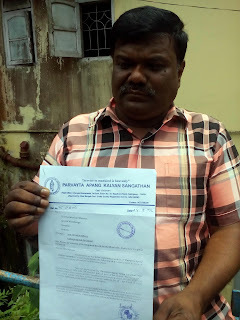 0 Respones to "Memo to CM for physically handicapped development board"